The trunk of a large oak tree grows on the right side of a narrow dirt road, with curving branches that hang over the road before dropping back toward ground level on the left side of the road. 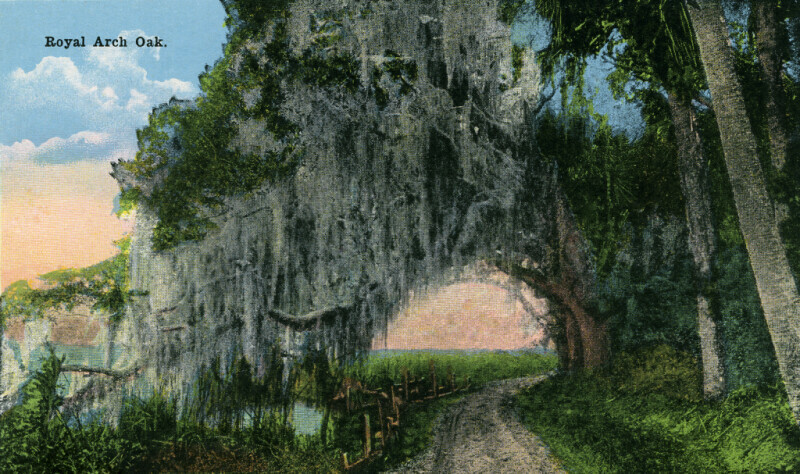 The branches are densely covered with Spanish moss, giving the appearance of a naturally formed tunnel. The road shows deep ruts from the tires of vehicles using the road. A rustic, wooden fence runs along the left side of the road. An idyllic meadow can be seen through the arching tree. There are rosy clouds on the horizon that suggest a dawn or dusk setting.